For the past two years I have heard more about knitting than ever in my entire life. That was because Allison started knitting two years ago. There is a yarn store down the street from us called Yarn it All and they were offering classes. Allison said one day, “I’m thinking about taking knitting classes” which meant that she was going to be taking knitting classes. We are very similar in that way, when we express that we are thinking about doing something that means that we’ve already thought about it and are going to do that something. So Allison started knitting. She picked it up right away. Her skills are amazing, I think. She’s made hats, socks, sweaters, blankets, prayer shawls, and baby blankets. She even made the entire family, including the cats, some Janye Cobb hats. Allison has taken her love for knitting everywhere. She knits in the car, on planes and she even knit all throughout IZEAFest 2008. She has also taken her love for knitting online. She is a member of the online community for knitters called Ravelry. Ravelry has become a part of our lives, Allison has met interesting people through it, she has found great new patterns to knit as well. Ravelry is looking for a new member of their team, someone who will work 20 hours a week as a communication liaison between the community and Ravelry. I think that this job is perfect for Allison. We made a decision when Eva was born that I would work so Allison could spend time at home with Eva. Allison did have a full time job up until the day before Eva was born. She was an Office Manager for a Management Consulting Firm. In that role she was technical support, communications manager, travel agent and all around dynamo. Allison staying home with Eva has worked out well and we would love to continue to keep things this way. However, in order to continue to do this we both need to pick up side things from time to time, I have blogging and Allison works about 9 hours a week for a friend of mine. 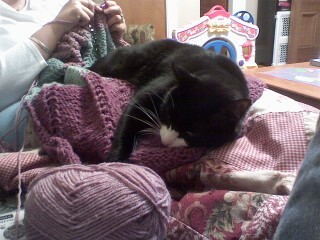 This does leave her plenty of time to fulfill the 20 hours a week with Ravelry. I think the responsibility and challenge and fun of a job like that would be amazing for her. She loves people and community so a connection outside the home and talking with other adults is just the thing. Allison has incredible writing skills and she loves to communicate with people. We go out places and she has found out life stories of at least 4 people while I barely can remember names. She genuinely cares about other people and making a connection and that is one thing that makes her perfect for this job. Her compassion and understanding make her a perfect person whose primary job is to communicate with an online community. Allison is also perfect for this because she has the technical skills needed for the job, she knows how to create blogs, use twitter, utterli, facebook, flickr and a host of other online resources. 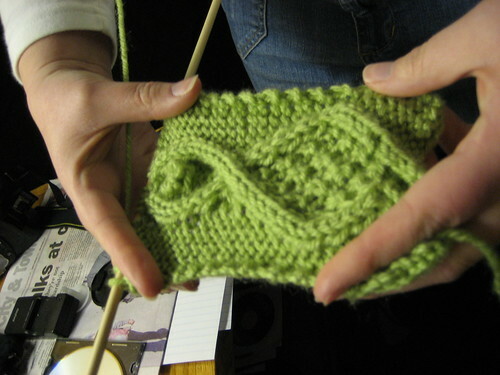 She is also extremely familiar and skilled with the Ravelry site and forums. When she doesn’t know something technical she learns about it and solves the problem. Allison also recently bought herself a netbook so she is able to be both mobile and connected at all times. So this part time online job with Ravelry would be a perfect fit for Allison. She’s even taken renewed interest in her blog and will be posting much more often now. So if Ravelry is looking for a skilled knitter who is a great communicator, problem solver and a compassionate hard worker then they should really consider Allison for this job. Sounds great! Good Luck Allison! Thanks Baba, We are really excited about this possible opportunity, she would be so awesome in this job. When she told me about the possibility I knew it just screamed “Allison!! !” I hope she gets it:) PS-That’s a lovely “post” of recommendation!! Kudos!! I really feel that she would be the best person for this job, it is so suited for her. Thanks for the good vibes. We are hoping that she gets the job too. You glanced over Allison’s current employment as only working 9 hours for a freind of yours. Allison works a standard 9 hours each week and additional hours as needed. What you say is true, if Allison does not know something, she finds out. When she came into work she knew very little about insurance, but she is picking it up quite nicely and has even made suggestions to improve processes. Not always easy to do in an established business. Allison discussed this with me yesterday, in an effort to get ahead of my reading the blog. She is a smart woman. Drew, you married out of your league. (Then again, who amongst us doesn’t). First off, you really should put the url to Ed Lambert Insurance in that url field in your comments. Free advertising my friend. I did mention that Allison works 9 hours a week, I didn’t mention that she is flexible int hat she takes on more hours as needed. I’m glad to get further insight from you on her performance at Ed Lambert Insurance. I don’t see that on a daily basis. And yes, we all did. You’re right Drew, this is the perfect opportunity for Allison and what a glowing recommendation you’ve given her! It always makes a job more interesting and enjoyable when it is in the field that you’re passionate about, in this case, knitting. I hope the opportunity is given to her, she deserves it and would do a great job. Thanks very much, I hope that Ravelry seriously considers Allison for the job. She’d be great. I think that is an awesome job for Allison! Thinking positive job thoughts over here for her. *fingers crossed* Good luck Allison, you’d rock at that job. Thanks, she didn’t get the job but we appreciate the warm sentiments. She would have been great at it.